With Christmas not far behind us we took a short hiatus from eating out but as January is now nearing an end it was time to pick back up our Where to Eat blog. We had a firey start to the new year and kicked off 2019’s series of local restaurant recommendations with Stepaside’s ‘Fire & Stone’ eatery. 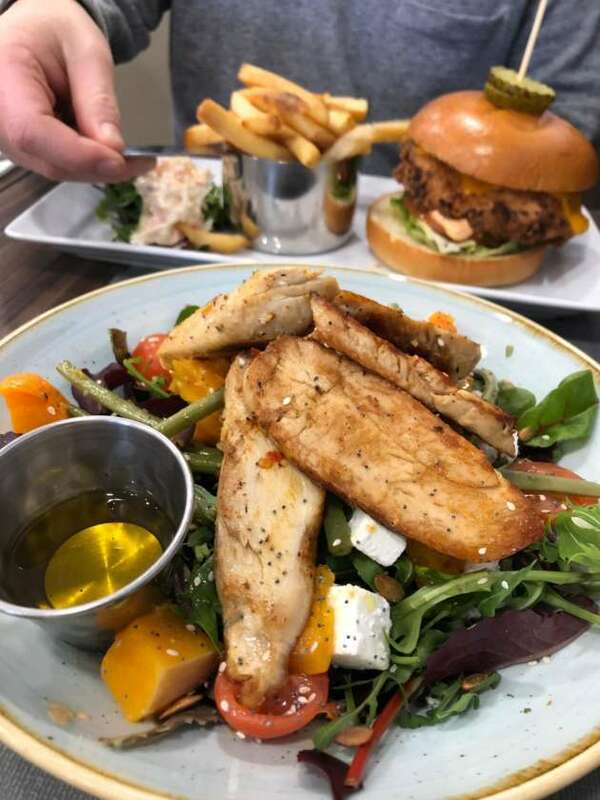 Located in Belarmine Plaza, just a stones throw away from our Belarmine Woods development, Fire & Stone café prides itself on being humble and relaxed, serving simple, exciting food and fantastic coffee. And that it was! The restaurant was bright, warm and welcoming and we were seen to our table straight away. As it was 1pm we were given the delightful looking lunch menu although I believe there is an equally yummy brunch menu on offer on the weekends. 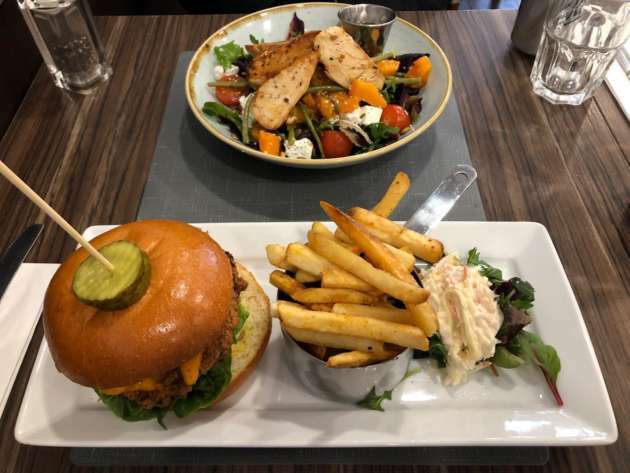 Still in the spirit of ‘trying to be good’ this January we opted to split the roast butternut squash salad and the buttermilk chicken burger. Our food arrived in perfect timing – we were both feeling peckish, but it was clear that everything had been freshly made. The roast butternut squash salad came with plenty of squash and was accompanied by a substantial amount of Cajun chicken and feta cheese along with mixed leaves, pumpkin seeds and a lemon-oil dressing. The chicken burger was an enormous southern fried chicken fillet wedged between a soft brioche bun, oozing with chilli mayo and melted cheese served with a healthy handful of fries and coleslaw on the side. The salad was light and fresh, but it still had enough substance to it to not leave you feeling hungry after as salads often do. The burger was one of the best buttermilk chicken burgers I’ve ever tasted (and I’ve eaten a lot of burgers!) The chicken was succulent, and the sauce had enough chilli to give it a kick without burning your tongue off. Neither dish disappointed – we practically licked the plates clean! As the cost of eating out in Ireland is steadily rising, we were pleasantly surprised to find that our lunch total was a mere €22.00 for the two of us. (€10.00 for the salad and €12.00 for the burger and fries). Delighted with the great value and deliciousness of our lunch we couldn’t but resist something sweet from the counter. 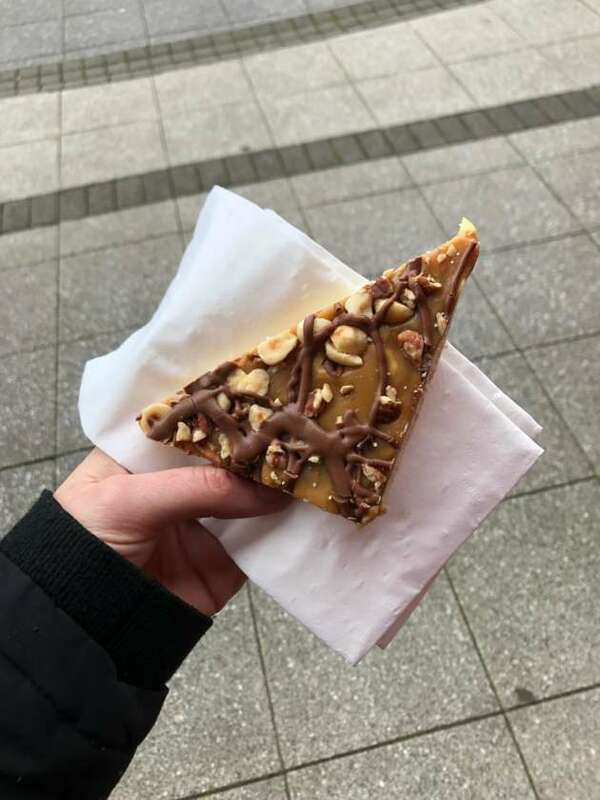 We chose a salted caramel slice topped with drizzled chocolate and peanuts to take away. However, it was so tempting looking, we ate it outside the café! Together with added bonus points for a friendly waiter and chatty member of staff at the till we would say Fire & Stone is a must-try try for any of you who have never been here before, and for anyone who has already…it’s time for a second visit. Fire & Stone is located in Belarmine Plaza, a short walk from the established Castlethorn development Belarmine Woods development in Stepaside. Our final remaining 4- and 5-bedroom houses and show homes are on sale now. Please contact Sherry Fitzgerald New Homes 01 667 1888 or log onto www.belarminewoods.com for further information.